Storage at cool & dry place please, refrigerate after once opening. 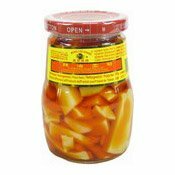 Ingredients: Bamboo Shoot Tips, Soybean Oil, Chilli, Salt, Acidity Regulator (E296, E330). Simply enter your details below and we will send you an e-mail when “Chilli Bamboo Shoots Tips In Oil (萬里香辣油雲筍)” is back in stock!